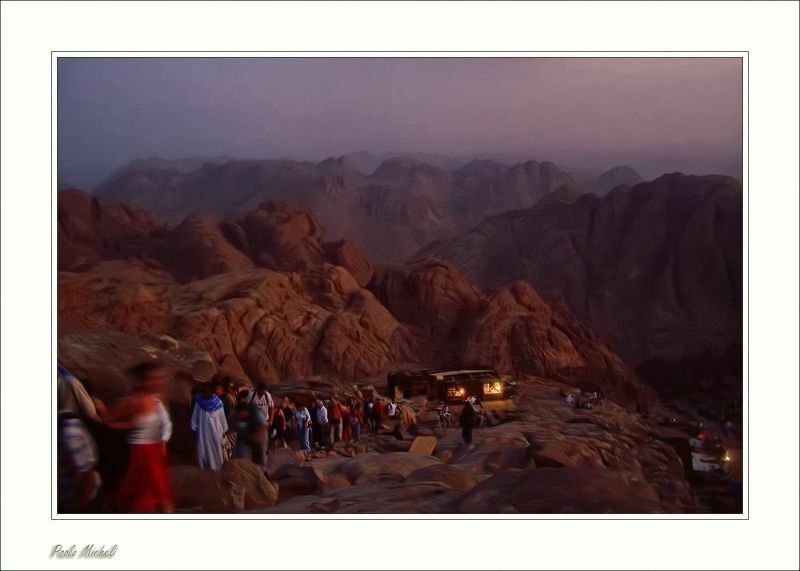 The climb of the Sinai Mt. "Even if you’re not religious, the chance to do a night time hike up this mountain, using torches, with the Bedouin people walking around with their camels, it’s still an experience to behold"
Markus Spring (Homepage) wrote: An outstanding image - I think I look at it now for the 5th time and will probably keep coming back to it. As a print it for sure will look gorgeous. beanow (Homepage) wrote: ow! wow! wow! Faaaabulous image! Really masterly! Alex (Homepage) wrote: Me gusta el efecto que has logrado con la gente, parecen fantasmas. Saludos. Andrés (Homepage) wrote: You managed to capture a very biblical feel to this. Great movement. Arjan - PlasticDaisy (Homepage) wrote: This looks very biblical. Beautiful image! Arnd (Homepage) wrote: Great lighting and a beautiful, dreamy scene. Really fascinating! Framed and Shot (Homepage) wrote: Great image, the dof and the soft blur gives it a bit of mystery. Agnès (Homepage) wrote: Such a unique experience and shot as well. Superbly captured, Paolo!! Bravo! Benjamin Madison (Homepage) wrote: Splendid photo. Very subtle lighting and color. Guido (Homepage) wrote: I hope a good experience also for you! Simone (Homepage) wrote: Da lasciare senza parole, davvero! wardy (Homepage) wrote: Wow - beautiful shot! Must have been a great experience! Marcie (Homepage) wrote: WOW! Amazing pilgrimage..so beautifully captured. Thanks for sharing the experience. WOW! BoB (Homepage) wrote: Fantastica luce. Frida (Homepage) wrote: A magical picture. It shows the atmosphere of the evening. pernilla (Homepage) wrote: Amazing shot! Wonderful light and tones. Pavan Kaul (Homepage) wrote: This is a stunning picture...I love the depth, scale and the light in the hut...the motion is awesome...great work! grant (Homepage) wrote: stunning shot, very powerful. mbecher (Homepage) wrote: Wow! Now this is a great shot.